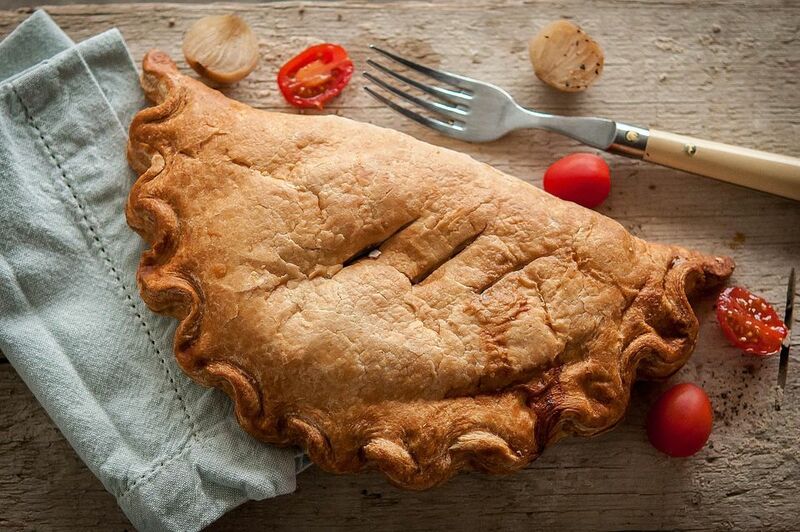 Like the Cornish pasty evolved for tin miners, who, unable to return to the surface at lunchtime had a hearty, easy to hold and eat, lunch, the Oggie was born from the same premise. Oggies are much, much larger (hence the name Giant Oggie) and contain ingredients more familiar to Wales – lamb and leeks. Pre-heat oven to 220 °C/ 425 °F Gas 7. 01 First make the pastry. Place the ingredients into a large mixing bowl and rub the fat and flour between the fingers to create a bread crumb like mixture. Add water and mix until the dough comes together in a ball. Wrap in clingfilm or plastic wrap and rest the pastry for 30 minutes. 02 Meanwhile, melt the butter in a saucepan, add the leeks and cook on a low heat for 5 minutes. Add the potato chunks to the pan and cook for another 5 minutes. Add the lamb pieces and brown all over, cook for two minutes, cover with a lid and cook over a low heat for 6 minutes. Season the contents of the pan with salt and pepper and leave to one side to cool. 03 Divide the pastry into 2 and roll each piece into rounds approx 22cm. Brush the rounds with beaten egg. 04 Divide the meat mixture between each pastry circle and place to one side of the circle. Brush the edges with a little more beaten egg. Fold the circle in half over the filling so the two edges meet. Crimp the two edges together to create a tight seal. Brush each pasty all over with the remaining beaten egg. 05 Place the pasties on a greased baking sheet and bake for 15 minutes, then reduce the heat to 180 °C and cook for a further 30 until the Oggie is golden brown.